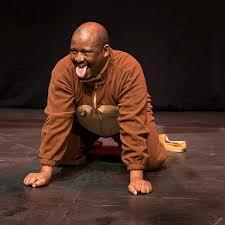 Be A Better Dog is a drama written by Makhubalo Ikaneng and starring Seiphemo Motswiri. It has one performance at the Hexagon Theatre in Pietermaritzburg on March 27, 2019. Be A Better Dog tells a tale of a Dog’s life while at the same time we get to see the world we live in through the eyes of a dog. The play uses humour and light commentary to speak to otherwise sensitive issues of class, care and abandonment as applied and taken up by the human being in an attempt to tackle life challenges. This one man show raises questions, challenging humans to introspect offering commentary on social issues. As a dog he grapples with questions such as to what extent is he a happy animal, and to what extent is he a traumatized orphan of human caused condition? Is any of it his own making and what power did he as dog have to change the situation? These are poignant questions that are relevant to a human world that is at crossroads with questions of destructive violence, corruption, injustice, racial discrimination, lack of care to the planet in and its inhabitants in general. In life we strive to be better human beings, but what does it mean to be better? And what does it take to be better? Be A Better Dog takes place on March 27 at 18h00 at the Hexagon Theatre on the UKZN Pietermaritzburg campus. Tickets R100 booked through hexagon@ukzn.ac.za or tickets at the door.